In the first decan of Aquarius, we saw that one of the most important factors upon which our blessings are secured is our union with Christ (see Piscus Australis). It is a union that is absolutely vital to our life in Christ. With Pegasus, we continue to see that not only do we receive our life in and through Christ, but we also receive His authority. Jesus Himself s aid in Matthew 28:18-19, “All authority in heaven and on earth has been given to me. Therefore go and make disciples of all nations . . . .” Do you find it interesting that the Lord gave us the instruction to evangelize the world based upon His authority? Jesus here is claiming universal authority, and then subsequently delegating some of that authority to us — so that we gain a confidence and assurance as we go out sharing the Gospel to a lost world. In Greek mythology, Pegasus was the famous steed which sprang forth from the blood of the Medusa after Perseus had decapitated her. Pegasus was said to have lived on Mt. Helicon where he stamped his foot and water issued forth from the ground. Here again, even in these man-made stories, we see a kernel of truth that survived because a river of life DOES spring from the ROCK (Jesus Christ) who, when struck on the cross, issued forth life. This horse is a mighty steed winging its way through the heavens. Notice that its great head touches both the water-pot and the head of Aquarius (see bigger picture found on the Star Chart page.). This star picture presents an extremely important juxtapostional truth. Pegasus is receiving the same life out of the water pot that Piscus Australis does — yet it is also touching the authority (the head) of Aquarius, who represents Christ. Again, we receive our life AND authority through our union with Christ. Pegasus is given wings by which he conducts his heavenly business of delivering all the promised blessings of God to the believer. (Be sure to notice the star names as they confirm this point.) 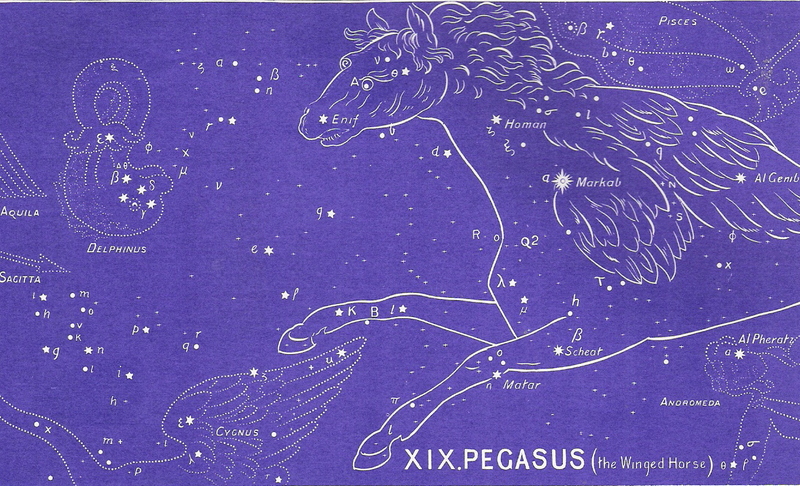 So, Pegasus belongs really in two world — He’s an earthly creature (a horse) that has been given a heavenly assignment and the wings by which to carry it out. Just like us! We are earthly creatures with a heavenly assignment to use the authority given to us in Christ to tell a dying world the truth. Our union with Christ was the theme of the last decan (Piscus Australis). Our blessings and authority are the themes of this one. We see in this two-natured beast both the blessings (on the wings — coming from the Son of GOD) and the authority (on the horse — given to us by the Son of MAN). Therefore, we see the two offices of our Lord — the heavenly (wings) and the earthly (horse). Our blessings spring from afar where our Father sends “every good and perfect gift.” But our authority is for here on earth where we are to minister the love of God to all men. In Christ, we are fully blessed and equipped. Or click on The Big Picture for more information about this Gospel in the stars. Be sure to download the Free e-book that discusses the ancient cultural, biblical, and historical evidences supporting this Gospel in the stars.